For all of my fellow toucan fans out there, I have decided to do some special feature interviews with owners of some of the other species of toucans out there. Paco, Paz, & Pepe are Toco toucans, the largest of the toucan species. So I figured what better way to start than with the opposite end of the spectrum – the Green Aracari. Green Aracaris are the smallest of the toucans, typically around 12-16 inches long and weighing around 4 ounces. Due to their generally affectionate disposition and the fact that they breed so successfully in captivity in comparison to the other species, Aracaris are the most popular toucans to be kept as pets. Green Aracaris, unlike our Tocos, are interestingly one of the only toucan species that are sexually dimorphic. Today, you will have the pleasure of feasting your eyes on the beauty of Touk, who as a male, has a black head and neck. If he were a she, he/she would be brown instead. Touk is a lively and loving companion to Anita and her partner, Marlean. Don’t let his pint size fool you – he is a whole lot of toucan goofiness, packed into a tiny body. I met Anita through the Yahoo Toucan Forum we both belong to and am constantly entertained by the antics she shares of her 6 month old Green Aracari, Touk. Touk rules the roost in their Fifth Wheel Camper, soaking up the sunshine in Las Vegas, Nevada. Now, I’m excited to give Anita the floor to share with you what it is like to be owned, as she says, by a Green Aracari. Hi, Anita! What made you decide to adopt Touk? How was your adoption process? I started researching breeders, but no one had any available as it was late in the season. I finally fell upon Miguel, who had four babies with only one spoken for. We emailed back and forth and he was very forthcoming with information, good and bad. When I told them I had read that they don’t bite, he told me I was wrong and that they can hurt you. That sealed the deal for me. I have had hookbills and my friend owned a bird shop; the thing I knew for sure is that all birds bite. When someone tells you that they don’t, they aren’t telling you the truth. Have you owned other birds prior to Touk? How are toucans different compared to your experiences? I think toucans are just a unique bird. I have owned parrot-type birds and also, as I mentioned, a Starling. Touk has a lot in common with the Starling – they also eat a low-iron diet, although more protein and veggies than a toucan does. Starlings are also softbills and cannot bite hard either, but boy, can they poke. However, unlike Touk, Starlings can talk and are also quite loud. ALL TOUCANS LOVE TO BATHE! My toucan is as different from a parrot as night is from day. Of course, parrots eat a diet of seed, pellets, nuts, veggies, and some fruit. Therefore, they do not poop fruit like Touk does. With parrots, it’s always about cleaning up the shells from seeds and nuts. The larger parrots’ poop is like cement – very hard to clean up after. Parrots also have dander, which is always there and I am very allergic to it. Parrots also love to chew; they can’t get enough things to chew on, so they can easily damage the house – nothing is safe. Touk, on the other hand, can’t redo my home. He is out of his cage a lot but the only thing he does is make stains on my window shades from fruit juice. I can’t get the stains off and the camper shades can run for $300 for one…so fruit juice it is. A small price to pay for the joy he brings. Parrots talk and scream; the more they scream, the happier they are. Now – when you live in the country, that is fine but when you live in the city, close to the next camper, that can mean war. My little Touk has a very quiet voice and if I did not tell you he was in the camper, you would never know he was there. Touk clicks and those clicks all have different meanings – he is still teaching me what. Touk is really quite fearless about most things. When I give him a new toy, he takes it, whereas parrots wouldn’t go near it until they become used to seeing it. Touk is not high-strung and does not pull out his feathers – instead, he pulls out my hair….kidding. 😉 When he helps me type, he does not pull the keys out of the computer, he just poops on it. Parrots love when things get loud. If you tell a parrot “NO” in a loud voice, that just seems to mean play to them. When I tell Touk “NO” in a strong voice, he stops for a minute. Touk’s beak is made for rubbing. If you rub a parrot’s beak, it means game on and you will get bit. Instead, Touk closes his eyes and loves it, allowing me to use his beak like a worry stone – rub, rub, rub. I can also give Touk just about any soft or hard object to play with (so long as he cannot swallow it) and his toys will not get ruined from chewing. What is a typical day in your life with Touk like? Our mornings start at 5am. Marlean gets ready for work and I do the feeding. The dogs go out and when they return, I have their breakfast ready. Then it is time to chop fruit for Touk. I stand and peel and chop for about 20 minutes, warm his fruit to room temperature, then give it to him. He has his breakfast and comes to each of us with a piece of fruit. He really likes clicking and showing us what he has. He helps us on the computer and then he gets under my robe, next to my chest, and snuggles in for a nap. Awwww…. During the day when I walk the dogs, I put Touk in his Pak-O-Bird and he comes with us. He loves being outside and while I wish I could let him out more, I can’t leave him alone in front of my camper as I am afraid something would happen to him. Midday, he goes into his cage for quiet time and comes back out around 2pm. He also likes to help with the housework, sitting on my forearm or hand while I pick up. Have you trained Touk to do any special behaviors? If so, was it difficult? I have not trained him to do anything special. He knows “up up”, of course, from when he was a baby. I tell him “up up” and he gets onto my hand no matter what he is doing. He also catches small, cat-type balls, which is his favorite game. Now he has taught the dog some tricks: when I throw him a ball, he drops it in front of the small dog, who grabs it and gives it back to me. So really…Touk has trained us all. What are your favorite things about having Touk in your life? Getting up in the morning and hearing his little voice from under his blanket. I also love that he loves to cuddle. Every night before he goes to sleep, he gets 10 blueberries handfed to him (because that’s all he can eat), he gets his beak washed, and he goes under my robe, down my sleeve, for a cuddle before going back to his cage. These are the best times! What would you say are the most challenging things about owning a toucan? Toucans have quirks that don’t seem to make any sense. When I painted my nails blue with sparkles, Touk went crazy and attacked my hands and feet. He just kept attacking as though his life were in danger and he had to kill the offending hands and feet. Marlean was laughing but it was far from funny to me because it hurt! I had to have my nails redone. So now I own a bird that tells me what I can wear (laughs)! He also does not like when planes fly overhead or when the birds outside chirp. He truly is a weirdo. As I mentioned before, the juice from his fruits is all over my window shades which are now a mosaic of color. A friend came over and said it looked like I did it on purpose. Cleaning his cage is also no easy feat – it gets sticky and the fruit gets in between the bars, which makes a mess. I use a handheld steamer to clean his cage, which really does help. Keeping him in fruit is a pain in the rump – the peeling and chopping can get old. I am going to buy a chopper. 🙂 Also, if you feed blueberries to him as he is running around the house, they will stain and you simply cannot get it out. Would you recommend Green Aracaris as a pet? Oh, yes!! I think these are just about the greatest birds around. Such a loving nature, not high-strung, and lots of fun. My Touk brings a smile to my face each morning and when I take him places, he is the hit of the show. Everyone wants to see him – so much fun! What would you tell someone who is considering adopting a toucan? Before you decide to adopt an Aracari, make sure you are willing to chop and feed fresh fruits and veggies for the next 15 years or more of your life. Be sure you can deal with the mess they make and get your bird from a good breeder! They are very social birds, so they need to be with you and not put in a room where they would be alone. Are you ready to give love? That is the most important question and believe me – you will get it back 10 times over. Thank you to Anita, Marlean, and Touk for sharing their lives with us. All of the darling photos in this article were provided by Anita. Coming soon – I will be posting some more toucan species feature interviews for some of the other members of the Toucan Clan – let me know if you have any requests or would like to participate. 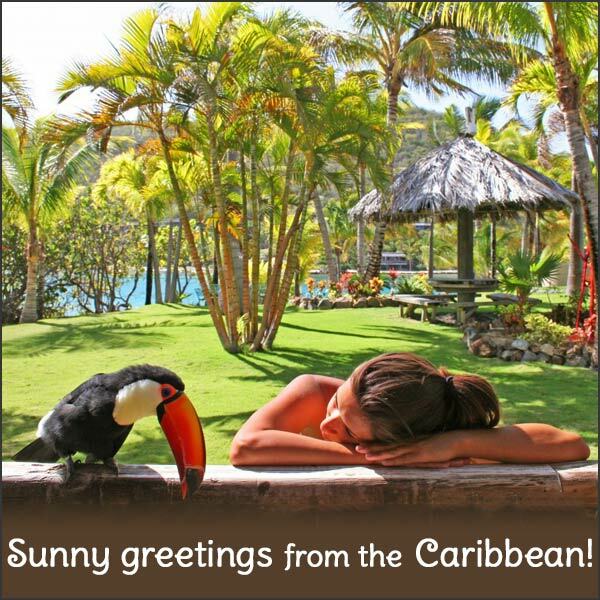 This entry was posted in Friends of Toucanland and tagged Adventures in Toucanland, aracaris, bird, birds, BVI, Caribbean birds, exotic birds, exotic pets, Green Aracari, island, pet, pet bird, pet birds, pets, smallest toucan, Toco, Toco Toucan, Tocos, Toucan, toucanland, toucans, Touk, tropical birds, tucan, tucans by Toucan Lady. Bookmark the permalink. Hey! I was wondering if you have any experience with sudden aggression? I have a almost 2-year-old green aracari. She attacks my feet and my hands, for some reason she just doesn’t like those. I’ve tried to play with toys with her but she would just end up going after my fingers and make a loud “GRACK” sound. I never get my nails done and nothing has changed with routine… She can be cuddly but this one day surprised me when she lunged at me! The bites were hard and I did draw a little blood. Is there some kind of training to help me deal with this behavior? Did anything change in her environment? New toys or something? It could also be hormonal. I would work on paying closer attention to her body language any time you’re interacting with her to prevent being surprised by aggression – there will be signs leading up to it, however subtle. I would also make sure you aren’t petting her in ways that can heighten hormonal changes – just stick to the top of her head for now, if at all. As for training, I’d recommend going back to basics to reestablish a relationship of trust with her – simple things like target training are a great place to begin. Sometimes we can’t understand why animals suddenly change their behavior, but it’s important to approach her now with respect and work to regain her trust with patience. Hello, I wonder if you would have any tips to give me. Cocosari, our 1 year old female aracari is super friendly, sleeps in her little hollow log, loves to come out and visit but is totally afraid of toys. I have tried to introduce them slowly but she remains afraid and uninterested. The only to she likes are rubber hair band and plastic bracelets… Any suggestions? Perhaps try incorporating things she loves – like the hair bands and bracelets – with new toys and allow her to approach them of her own volition when she’s out of the cage exploring. Also, play with things a bit yourself when she’s out and see if that perks her interest. They all are individuals and some will enjoy toys more than others. Keep trying different things too – with our three Tocos, they all had a varying interests when it came to types of toys. My green aracari tucan does not groom himself. Is it because of his bill? How can I get him clean? He does not take a bath in his water bath bowl. Hi Sarah, Hmm…that is interesting. In my experience and in speaking with many fellow toucan owners, if there’s one thing toucans are obsessive about, it’s bathing. Mine take long, soaking baths pretty much every other day. Bathing is a very important part of maintaining your bird’s overall health, so I would start working with his environment to ensure bathing is conducive (is it warm enough? Is the bath bowl the right size? Is he eating a healthy diet? Does he feel safe in his space to bathe?). They are able to preen and bathe just fine with their bills, so that would not be the reason your aracari isn’t bathing. Perhaps this article may be helpful to you: http://www.birdtricks.com/blog/bathing-your-parrot-properly/ . I laughed at your different descriptions of Touk. I have a 3yr old female green aracari named Maui that we have had since she was 2mths old and she is so sweet and amusing. The only bad thing is if I (or the close family members she sees everyday) leave town for more than a few days. She gets mad and pays me back for a day or two every time. As for training voluntary nail trimming, I haven’t yet taught mine that but if I were to, I’d go about it the same way I would train a parrot – the training sessions would just have to be shorter, due to the small attention span of toucans. Training toucans, in general, can definitely be a challenge, but she sounds so well-socialized with you that your relationship will help enormously. Kudos for wanting to try! There is a parrot training video available through http://www.goodbirdinc.com that teaches how to train your bird for a vet appointment. Perhaps that would be a help to you. Best wishes, do keep in touch!